Next Day (Next Working Day | Guaranteed) Order selected products before 12:00pm to be eligible. *Delivery dates are subject to timely approval of artwork. Delivery to non-mainland and remote UK locations (including Northern Ireland) is capped at a maximum of £10.00, regardless of how much you order. Delivery to the Channel Islands is capped at a maximum of £20.00. BFPO delivery charges are not capped. Austria, Belgium, Bulgaria, Czech Republic, Denmark, Estonia, Finland, France, Germany, Gibraltar, Hungary, Ireland, Italy, Latvia, Lithuania, Luxembourg, Malta, Netherlands, Norway, Poland, Portugal, Romania, Slovakia, Slovenia, Spain, Sweden, Ukraine. - Minimum charge £7.00 for up to 5 items. - £0.50 per additional item up to 50 items. - £0.25 per item for over 50 items. Please be aware that local taxes may apply at point of delivery. - Minimum charge £20.00 for up to 5 items. - £0.50 per item thereafter. If you need to place multiple orders going to the same address, our system will automatically group these orders for you and remove/reduce (as appropriate) the delivery charge on orders placed after your initial order. To make use of this system, please place your additional orders as soon as possible as subsequent orders can only be grouped together if the garments on your initial order have not yet been picked by our warehouse. Please be aware that this service is only available to orders to Mainland UK. We are also able to offer collection from our Manchester warehouse (M17 1EH). This can be selected during the order process. Collection is free, however any express production charges will still apply. We'll email you when your order is ready for collection. Standard dispatch for all orders is 6 working days, however at peak times the dispatch time can be longer. If you need your order by a specific date we will try and work towards this for you, but we can only guarantee a dispatch date if you select and pay for our express dispatch service. An estimated delivery date will be displayed when you process your order. Please note, this date is dependent on you promptly responding to any communication from Clothes2order, such as to approve an embroidery proof. Failure to do so may impact on our ability to meet the originally specified timeframe. Deliveries are made from Monday to Friday between 8am and 6pm. There are no deliveries at weekends or on public holidays. We are not able to deliver to PO BOX addresses. We will notify you by e-mail when your order is dispatched. UK orders are dispatched by DPD Local; orders outside of the UK are dispatched by UK Mail. If your order is dispatched by DPD Local, they will notify you directly of a 1 hour window when your order will be delivered. Please note if you are not in when the order is being delivered it will be left with a neighbour unless instructed otherwise. What happens if I am not in to receive the order? If the driver does not find you in to receive the goods, he will try again the next day. Normally two attempts will be made to deliver the goods. The driver will leave a message quoting a telephone number. Please ring this number to arrange a new delivery date. If they are unable to contact you at all, the entire delivery will be returned to our warehouse. In this case you will need to pay for the goods to be redelivered again. What happens if I want to cancel an order? We try to ensure the shortest possible delivery time. In order to be able to offer you a fast delivery service, many orders will be dispatched within hours. This means that unfortunately it is not always possible to cancel your order. Expenses are incurred once an order is placed with us including artwork production, ordering of materials, and placement of orders with vendors which are subject to their cancellation or restocking policies and charges. If an order is cancelled once placed, Clothes2order reserves the right to charge for artwork fees, restocking costs and any other expenses incurred by us between the time we received your payment and the cancellation request was received. Our goal is one-hundred percent customer satisfaction, so if you are unhappy with your order please contact us. As we provide personalised goods, however, we cannot accept returns unless we have made a mistake or the garments are faulty. Please return any faulty goods to us within 30 days of receipt for investigation. Please be aware The Distance Selling Regulations Act of 2000 does not apply to "personalised goods or goods made to a consumer's specification". Before placing your order, please be careful to check product size information. As we supply garments from different manufacturers there is no such thing as a standard size, for example a medium produced by Fruit of the Loom may differ to a medium by Gildan. 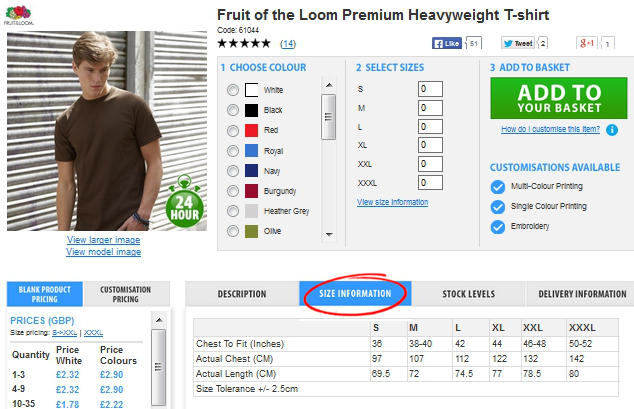 On every product there is accurate sizing information for that item under the ‘Sizing information’ tab, just to the right of the product description. This will give you the information you need to make a decision on the sizes you wish to order that product in. Once a garment is personalised we can only accept returns based on sizing issues if the product does not measure what we say it will on that items size information. If you receive garments that do not measure what we say, please contact us where our customer service team will be happy to help. All personalised items from Clothes2order are made to order; this includes items purchased from our "pre-designed" section or items purchased through affiliated merchandise stores. Blank products can be returned to us within 14 days of delivery for a refund of the cost of the item. Please contact customer services with your order number if you would like to return blank items and they will provide further instructions. If you have any other delivery related questions, simply contact our friendly UK based support team who will be happy to answer any questions you have.